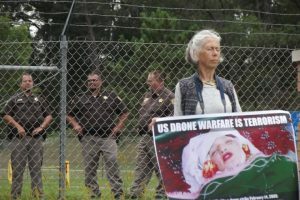 On March 19, 2015, on the 12th anniversary of the U.S. invasion of Iraq, seven members of the Upstate Drone Action Coalition were arrested at Hancock Air Base outside Syracuse, New York. The group states that the protesters “were nonviolently protesting Hancock’s lethal and illegal use of MQ9 Reaper drones over Afghanistan and elsewhere. One of the defendants, Ricks said today: “I first started doing social activism work when my child witnessed someone getting shot by a police officer. I became active with the Shawn Greenwood Truth and Reconciliation group, named for the person who was shot. It was there that someone from the Catholic Worker told me about an anti drone killing meeting. “I learned that our government is assassinating people in other countries and this violates the UN Charter — which, as a treaty, the Constitution says is the supreme law of the land. But the judges and police are ignoring that. We’re working to uphold such laws. Our country isn’t supposed to use violence or even the threat of violence without proper authorization, which it didn’t get when it invaded Iraq. “Yesterday I saw George W. Bush on TV talking about how power is seductive and corrosive. Well, he illegally invaded Iraq and was never held to meaningful account. “Everyone in our group takes an oath of nonviolence when we try to expose what they are doing at this military base. “And now it’s troubling that Trump is calling for more military spending. He’s appealing to people’s anger over many of the wrong things. Grady is part of the Ithaca New York Catholic Worker movement, which has been a key part of organizing against the U.S. government killer drone assassinations program outside Hancock Air Force Base in upstate New York.